We’d love your help. Let us know what’s wrong with this preview of Undivided Rights by Loretta J. Ross. Vibrant. Strong. Fierce. 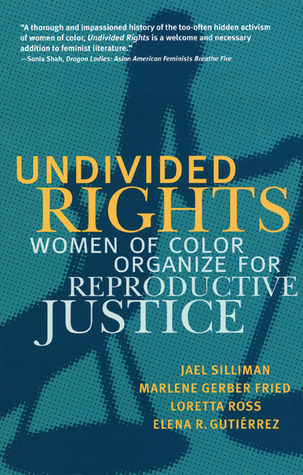 Undivided Rights captures the evolving and largely unknown activist history of women of color organizing for reproductive justice—on their own behalf. To ask other readers questions about Undivided Rights, please sign up. I hate when people say the pro choice movement is made up of white, middle class women. Mostly because it is, but also because non privileged women have been fighting for within the reproductive justice movement, not the pro choice movement. Confused? Read this book and it'll clear it all up. This history of women of color organizing in reproductive rights and justice is a good place to start if you're interested in unsung feminist struggles. The fact that I hadn't heard about the majority of the organizations in this book - who are all doing incredible work - is really an indictment of the lack of inclusiveness in the mainstream (white, middle class) abortion rights movement. WOC have really had to go out on their own to advocate for culturally specific issues, and the creation of r This history of women of color organizing in reproductive rights and justice is a good place to start if you're interested in unsung feminist struggles. The fact that I hadn't heard about the majority of the organizations in this book - who are all doing incredible work - is really an indictment of the lack of inclusiveness in the mainstream (white, middle class) abortion rights movement. WOC have really had to go out on their own to advocate for culturally specific issues, and the creation of racially and ethnically specific organizations is strongly supported here. There's also a thoughtful discussion in the last chapter about what it means for organizations to be ethnically specific, and what "having a seat at the table" with mainstream organizations really means. Although tedious in the way it recounts the organizational evolution and structure of these groups, there are certainly lessons to take away from each group's struggle to grow, access funding, and achieve social change. The section on black women's activism has some crucial points, but if you've read the outstanding Killing the Black Body, there's nothing particularly new here. But this book was my first exposure to Native American reproductive rights issues and organizations; I was particularly impressed by the work of Katsi Cook at the Mother's Milk Project, who has integrated land rights and environmental justice into a reproductive health framework. A good, informative overview on different organizations founded by women of color during the late twentieth century. Although I could've easily done without the way it was structured. Felt a little repetitive. But I'm a weirdo who hates going through the motions. Loved this book. You'll learn something in every chapter. Easy to read, and engaging. I didn't want it to end. Women of color are the true revolutionaries, and we need to learn from them and trust them to show us the way out of Capitalism. This work is a great tribute to those women. They understand that women's health care is about much more than just birth control and abortions. You'll learn a lot from this book. For any and everyone working in the health care industry. I love how things are broken down and explained. I loved learning about the different organizations and as someone working in the repro rights movement for a mainstream org as a WOC, this book witnesses and testified to my many experiences. It explained and gave language to things that can hurt. Lots of information, but some really good insight from incredible individuals. An essential primer on the reproductive justice movement, as it centers the histories and experiences of women of color. Loretta J. Ross is a Visiting Professor of Practice in the School of Social Transformation at Arizona State University teaching "Reproductive Justice Theory and Practice" and "Race and Culture in the U.S." for the 2018-2019 academic year. Previously, she was a Visiting Professor at Hampshire College in Women's Studies for the 2017-2018 academic year teaching "White Supremacy in the Age of Trump." Loretta J. Ross is a Visiting Professor of Practice in the School of Social Transformation at Arizona State University teaching "Reproductive Justice Theory and Practice" and "Race and Culture in the U.S." for the 2018-2019 academic year. Previously, she was a Visiting Professor at Hampshire College in Women's Studies for the 2017-2018 academic year teaching "White Supremacy in the Age of Trump." She was a co-founder and the National Coordinator of the SisterSong Women of Color Reproductive Justice Collective from 2005-2012, a network founded in 1997 of women of color and allied organizations that organize women of color in the reproductive justice movement. She is one of the creators of the term "Reproductive Justice" coined by African American women in 1994 that has transformed reproductive politics in the U.S.